If you suspect your cat is not drinking enough water, you are probably right. Since cats tend to be picky about a wide range of things, it’s no surprise water is one of them. While it might not seem like a major problem, or if you think your cat is drinking while your not around. It is always best to err on the side of caution when it comes to your cats health. The amount of water a cat needs depends on a number of factors. The main one being the cats size, a larger cat will need a lot more water than a kitten. Next the activity level of your cat can play a role in how much water they might need. If you have a cat that lays around the house all day, they will probably need less water than a cat that is outside and playing. And one more contributor to a cats water needs is the climate. If your cat lives in a hot or dry environment, they will need to rehydrate much more frequently. After taking these factors into account, a cats water needs will still fall into a predictable range. The average cat will need from five to ten ounces of water per day. If a cat is fed only dry food, you should aim for the higher side of this range. 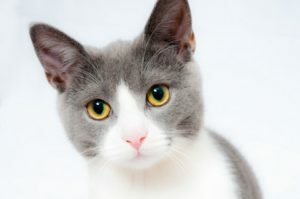 Otherwise if a cat eats only wet food, you can be satisfied if they drink at least five to eight ounces of water a day. The rule of thumb for how much water a cat needs is one ounce of water per pound of body weight. If your cat is not drinking enough water some outward signs may appear. Some of the symptoms of dehydration can be life threatening. If you believe your cat is suffering any acute side effects of dehydration, take them to the veterinarian immediately. Skin Health. If your cats skin has become dry and they have more dandruff than usual, this can be an early sign of dehydration. Also if their skin doesn’t spring back when pulled on, or otherwise manipulated. It can be a strong indicator of a lack of moisture in their skin. Activity Level. 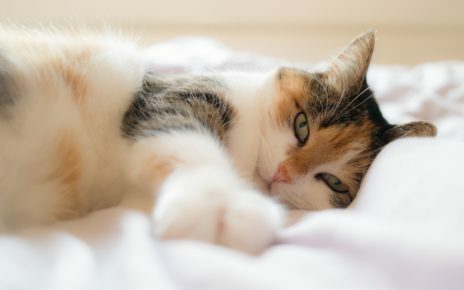 If your cat has become more lethargic, or is not behaving normally this can be a cause for concern. If you know the cat has not been drinking for a long time, then these symptoms may require a vet visit. Infrequent Urination. Another sign of dehydration is if you notice your cat has not been using the litter box as often as they used to. Or if when the cat uses the litter box they have a hard time urinating, or very little comes out. Besides this being an indication of dehydration, it can also point to a more serious health concern. 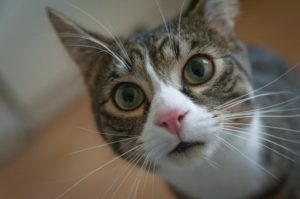 If a cat hasn’t been drinking for a long time, stones and crystals can form in their urinary tract. If this happens you will have to take the cat to get medical treatment immediately, since this can become a life threatening condition. If you want to get your cat to drink more water and they are still eating normally. Try adding water to their food. This can be a good way to supplement their daily water needs. It can be especially helpful if you are feeding a dry food only diet, while most dry foods contain 10% moisture it can be a big help to add a little water to it. The best way to hydrate dry food is to add a little water, then let it absorb before feeding it to your cat. The dry food will become softer in the process which may or may not be more appealing to your cat. 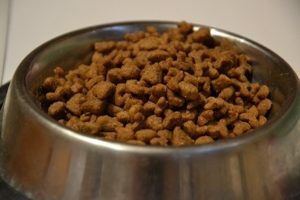 One minor concern with soaking dry food is you can no longer let it sit out for a long period of time. It will now be more prone to spoiling since it’s wet. You can add water to wet food, but the benefits will be less pronounced. Since wet food is already 80% water you can’t add much more. 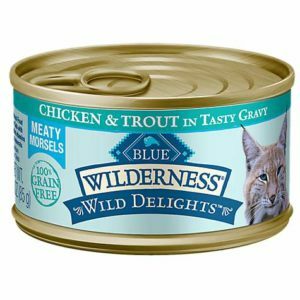 If you do want to sprinkle some water on a cats wet food, make sure you don’t add so much that the cat food turns into complete mush. As long as the cat will still eat the food though, feel free to add as much water as needed to keep your cat hydrated. By strategically placing water bowls around the house, it can help peak your cats curiosity. And it might encourage them to give the new water bowls a try. Cats tend to be nomadic creatures, therefore drinking from a bowl in a single location everyday might not appeal to them. In nature cats can roam over large distances, and will find places to drink all over their territory. If we want to provide the most natural environment for our cats, we should really try to mimic their instinctual behaviors as closely as possible. Cats can be very selective when it comes to the type of bowl they want to drink from. The first thing you can look for is if your cat is trying to tip over their bowl, or otherwise move it around. If you see a cat engaging in these behaviors, the bowl might not be stable enough. To remedy this problem find a bowl with a wide base and a low center of mass. A more stable bowl might make your cat feel more comfortable drinking out of it. The material a bowl is made out of, can also cause a cat to turn their nose up at it. This can especially be the case when it comes to plastic bowls. Plastics tend to have chemical smells, that cats can be sensitive to. And besides the smell, plastic bowls can also leach BPA (bisphenol A) and other toxins into the water. If you want to try bowls that are less likely to offend your cat. You can try metal, glass or ceramic bowls. These materials are all less likely to produce odors or leach chemicals. And while these alternatives might be safer. 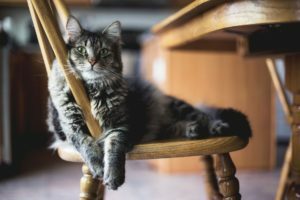 In the long run it comes down to what your cat prefers, so don’t be afraid to try a few different options. If you are feeding your cat exclusively dry food, it is a good idea to consider moving them onto a wet food diet. If you make this one little change, you can increase their water consumption, without having to push them to drink more from other sources. 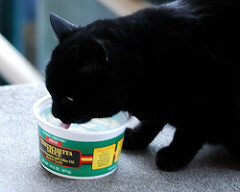 Wet foods are also healthier for a cat versus a dry food only diet. It makes sense, since cats never eat kibble in the wild, so feeding them dry food was never really a natural thing to do. 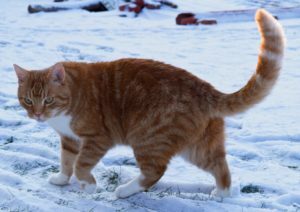 The major concern with feeding a cat a dry food diet is crystals forming in their urinary tract. 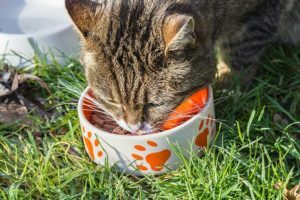 Because dry foods don’t have enough moisture, they are one of the leading causes of kidney and urinary conditions in cats. So if you want your cat to drink more water, and have a lower likelihood of health problems switch them onto wet food. 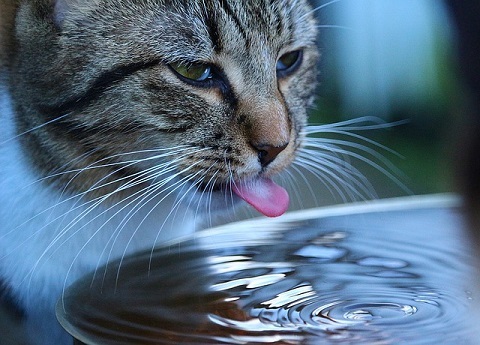 Cats have a very strong evolutionary preference to drink flowing water instead of still water. This preference is mainly due to the fact that stagnant water is prone to harboring bacteria and viruses. So when a cat has a choice to drink from a flowing water source, instead of a still one like their bowl. They will prefer drinking from the flowing one the majority of the time. 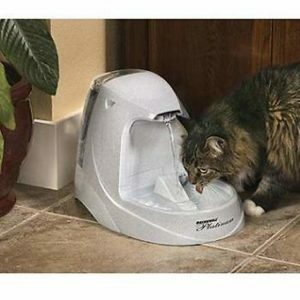 This is where pet water fountains can help increase your cats interest in drinking more water. These water fountains will first off draw your cats attention. 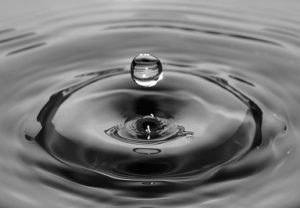 And even if they are not thirsty, you will already have made some progress, by focusing them on water in the first place. The smell of water will also be more pronounced around the fountain, which can help trigger a cats natural instinct to drink water. And along with the benefits a flowing water fountain will give to your cat, they will also add a soothing waterfall sound to any room they are located in. In most cases when a cat is not drinking enough water, they will usually still be eating. This indicates they still have a drive to taste and eat food. You can tap into this subconscious drive by adding the flavors of their favorite food to their water. If your cat likes tuna or any other fish, you can drip a little of the liquid from the can into the cats water. Or if your cat only likes their own cat food, you can let the water sit in the cat food container before pouring it into their bowl. Or you can serve the water directly in the cat food container, if that is something you would prefer to do. 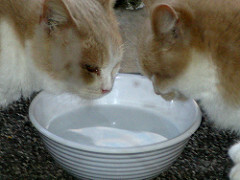 Even if the water in a cats bowl looks clean, they still might not drink it if it has been sitting out for a long time. 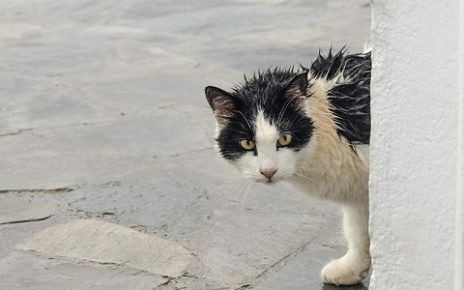 Just because you might think the water hasn’t been sitting out for very long, doesn’t mean your cat has the same opinion. 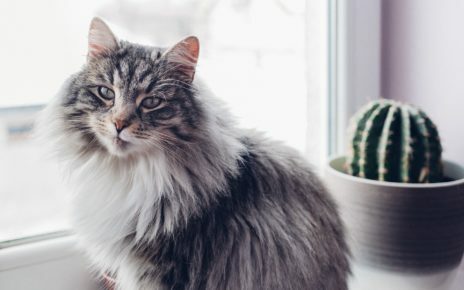 Some things a cat might be sensitive to is if the water has a stale smell, or it has become tainted by the bowl or other particles in the environment. You never really know why a cat doesn’t like their water. 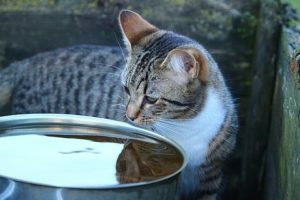 So just to be sure the age of the water is not the problem, change your cats water regularly to increase the odds of getting your cat to drink more. Keeping their water away from the litter box should be obvious enough. But in some circumstances it can be one of the reasons a cat is not drinking enough water. We all know we wouldn’t like to drink out of a bowl on the floor of our bathroom,. So you can be pretty sure a cat isn’t too happy about it either. Not only will this cause a cat to shy away from the water, it can also lead to health problems if they do drink the water. 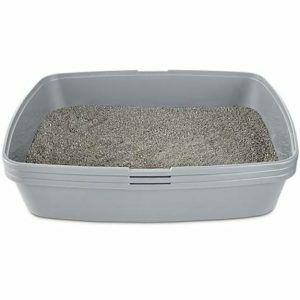 A water bowl located near a litter box, runs the risk of having litter and other particles getting into the water. 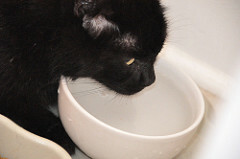 A cat who drinks this water could get sick from a wide range of bacteria or parasites. So move any water bowls away from the litter box, to make it more likely your cat will drink their water and stay healthy. Just like most people a cat will prefer a refreshing mouthful of cold water, over tepid room temperature water any day. Cold water is also an indication to a cat that the water is fresh, and hasn’t been sitting around all day. Fresh cold water can also mask any off flavors that may be present in tap water. If you find it hard to keep providing cold water to your cat throughout the day, you can use ice cubes to keep the water cold longer. 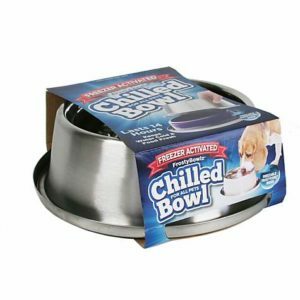 Another option would be to use a freezable water bowl, these bowls can keep a cats water cool for hours. Some cats are fascinated with running water and will more readily drink from the faucet then a water bowl. If this is the case with your cat, you might want to encourage this behavior. Especially if you think they are not getting enough water. While this can be a temporary solution it will be hard to keep up in the long run. Either you would have to let your water run all day, to give the cat access to water whenever they need it. Or you would have to be there to turn on the faucet when your cat is thirsty. 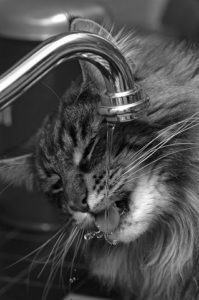 Unless you can train your cat to turn the faucet on and off, this method should only be used to provide supplemental water.